Do you remember that song from elementary school? It was my favorite. Anyway....who am I getting to know? The new gym. Duh. It's like making a new friend. Though this friendship has started out a bit rocky. This past weekend my husband and I decided to try one of the many classes offered at the new gym. We found one called 50/50 which was described as 50% strength and 50% cardio - and the cardio was 'to be posted at the start of class'. We were not entirely sure what that meant, but figured it would be a good workout, and some nice variety, so we'd give it a shot. We run over to the gym and race into the classroom to ensure we arrive on time for the class as we know the spin classes fill up quite quickly. We barrel into the classroom, and look around. Not a soul in the room. Oh wait...there's one lady...in the corner....ferociously lifting hand weights. Yes, ferociously, there is no other way to describe it. We meekly stand in the middle of class, checking and rechecking the schedule posted to ensure we are there at the correct time. As we check the schedule we note that the "posted cardio segment" will be Step. Okay, cool, we can do that. At our old gym we took a 50/50 type class that had some step things, running up and down on the step - no biggie. Slowly people start filtering into the class, and we quickly find that we are the youngest people in the room. Youngest by about 30 years. We whisper to eachother, wondering if we missed the asterisk that noted this was a geriatric class. Nope, doesn't appear so. We laugh to one another, thinking that we are going to kick some old lady behind in this class. Sweet. We may be in a room filled with old people, but that's probably good for our ego. We are both in very good shape, but we don't match up to those grunting weight lifters in the gym. Or those girls who run on the treadmill like a gazelle, and appear to be totally unscathed by the fact that they are RUNNING. When I run, I put my heart and soul into every freaking step and I am keenly aware of every minute that passes. 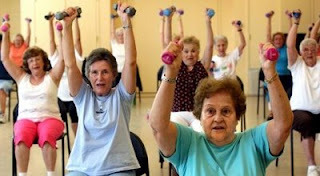 So, a workout with the old ladies, might not be so bad. We pick up the necessary equipment, and decide, you know what....we should go one step taller than all of these old ladies, since we're so young and fit. We get our extra tall step, balance ball, hand weights and bands, and wait for the class to begin. Since we were the first ones there, our steps were placed front and center with the rest of the class behind us. We start with a simple up and down step on the box. Then it's a little side leg lift as you step up on the box. Okay..I can handle that. But I would appreciate if she would slow down a bit. These foreign commands leave Jeremy and I standing dead center, middle of the room, wondering what has hit us. We try our best to follow along, and not look like complete idiots, with little success. EEveryone around us appears to know what to do. It's like they had a rehearsal before class that we missed. How do they all know what to do? I begin plotting my move. I have to get my step out of the center of the room. There was no break to conspire with Jeremy, so I had to just move, and hope he would follow. I found an open space in a corner of the room. My plan was to jump to the side of my step, and quickly push it clear across the room into the corner, so I could continue to stumble on and off of the block in the safety of the corner, where nobody could see me. I count down in my head....5, 4, 3, 2, 1...IT'S GO TIME. I push my step into the corner, and look back to see a befuddled Jeremy standing on top of his step. He has stopped trying to do the 'moves' and is just standing on his block, looking at me, in my new spot in the corner, motioning for him to join me. He stays in his spot for a couple more minutes, attempting to re-enter the class. And by attempting I mean he is really just stepping on and off of the step because he can neither understand, nor perform the actions the teacher is requesting. I stand safely in my corner, attempting to compose myself through complete hysteric laughter watching Jeremy attempting to keep up with the class. I wonder if we are really going to let this go on for another 20 minutes and motion to him that we need to get the heck out of there. Through hand motions and lip reading I communicate that he should grab our water bottles on the other end of the room while I make a run for it. He crouches low to the ground, as though that will allow him to grab the water bottles without anyone noticing, scoots over to the corner where they lie, and then runs out of the room like he's being chased. Sorry step class, you're not for us. Wow, your new gym sounds kinda nightmareish. Hope you like it more as you get to know it. OMG. I am hysterically laughing picturing Jeremy standing alone, stepping up and down in front of the class. How do things like this keep happening to you guys?? I love it.